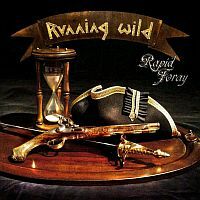 Perhaps Running Wild have been a little reluctant to roll their sleeves up in the studio since “Resilient” (2013), however, this year German heavy metal legends are back with a life affirming confirmation of their worth. “Rapid Foray” is the neon sign above a fortified metallic edifice housing formidable riffage and bucketloads authentic heavy metal attitude. A look towards the future is being displayed throughout the album; meanwhile the band doffing their caps to corners of the past is also detectable. Musically, Running Wild are inspired, keen on stretching their muscles and giving their fingers some thorough exercise, their distinct style agile more than ever before, not least on the galvanizing instrumental “the Depth of the Sea”. “Blood Moon Rising”, on the other hand, is a power metal charger, all liberally tattooed with the mark of vintage Running Wild. Meanwhile, if you want modern heavy metal anthems try “Into the West”, “Hellestrified” or “Black Skies Red Flag”. You can hum’em while plucking your eyebrows, or stretch your neck muscles to them. Whatever the case; “Rapid Foray” can stand as a proud flag bearer of modern heavy metal.